Today’s tip was inspired by a recent “Personal Health” column by Jane Brody in the New York Times called Relearning How To Eat Fish. Among other suggestions, the article urges that you expand your fish and seafood horizons, perhaps starting with a delicious bowl of good-for-you steamed mussels. Fish and shellfish are the most nutritious sources of animal protein, and while Americans have been learning to eat more fish and seafood, we should be eating much more of them. Yet, surprise of surprises, almost all of the delectable, nutritious fish caught in American waters is exported to other countries. Instead, a whopping 86% of the fish and seafood we consume is imported. About one-third of all our wild catch is exported, while we choose to eat farmed fish and shrimp imported from countries like Chile, China and Thailand. Almost all the shrimp consumed in the U.S. is imported, half of it farmed in Asia—mostly, says Brody, “under conditions that would ruin even the most voracious appetite.” (If you want to know more, search for any article on shrimp farming in Asia). Shrimp is the favorite seafood in the U.S. But the shrimp we eat farms in Asia have been swept by bacterial and viral infections. When a site becomes unusable, shrimp farmers simply move on, destroying more miles of mangrove along the shore and wrecking habitats for all manner of wildlife, including spawning fish. No matter how much you love shrimp, unless you’re buying from a top restaurant or fishmonger, you may wish to switch to mussels. 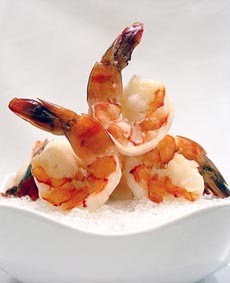 Photo of premium tiger shrimp courtesy Caviar Russe. The world’s population consumes some 170 billion pounds of wild-caught fish and seafood per year, caught in oceans, rivers and lakes. If everyone were to eat at least two servings of fish a week, as nutritional guidelines suggest, we’d need 60 billion more pounds per year to meet the demand. Hence, fish farming is here to stay, along with, more than a few cases, its negative environmental impact and less than sanitary conditions. The most popular fish in the U.S. are salmon, sea bass, cod and tuna; shrimp, at the top of the seafood list, is by far the most popular shellfish. For salmon, substitute other oily fish such as anchovies, bluefish, herring, mackerel, and sardines. For the overfished and declining cod, take a look at Alaskan pollock, the fish used to make fish sticks, fast-food fish sandwiches and the “crab leg” of California rolls. Keep an eye out for different varieties—abalone or orange roughy, for example. It’s easy to look online for delicious ways to prepare them. 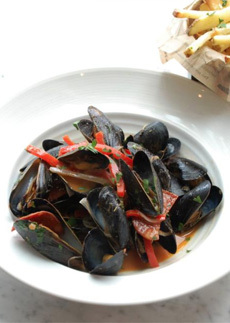 Enjoy mussels, as often as you like. In an ideal world, says Brody, mussels would replace shrimp as America’s favorite shellfish. Like other bivalves (clams, cockles, mussels, oysters and scallops), mussels are filter feeders that cleanse the water they live in. In the process, they gain valuable omega-3 fatty acids from the algae they consume. And, in drastic opposition to shrimp, they are nearly always sold from hygienically farmed stock. Mussels are also low in calories, and much lower in cholesterol than shrimp and squid. And they’re easy to cook, steamed in easy preparations like Mussels Marinière (recipe below), steamed in white wine, Mussels Provençal with tomatoes, garlic and herbs, or Mussels Marinara, similar to Provençal but with oregano. Add some chili flakes and you’ve got a spicy Mussels Fra Diavolo. Duplex On Third | L.A. To see how easy it is to enjoy a pot of mussels, here’s the classic recipe for Moules à la Marinière from Mastering the Art of French Cooking, by Julia Child, Louisette Bertholle, and Simone Beck. It is typically enjoyed with baguette croutons, and served with sides of green salad and frites. Pair it with your favorite white wine (we’re partial to a Sancerre or a Sauvignon Blanc with this dish). 1. DISCARD any raw mussels that are open or have cracked shells. Open shells indicate a dead mussel, cracks in shells foster bacteria. Similarly, discard any mussels that don’t open after steaming. 2. WHISK together the flour and water in a large mixing bowl. Add the cleaned mussels, adding more water as needed to cover the mussels. Soak at least 30 minutes so the mussels can disgorge any sand or grit. 5. DRIZZLE or brush the baguette slices with olive oil and toast them. 5. SCOOOP the mussels in shallow soup or pasta bowls; ladle the broth on top. Garnish with minced parsley, and serve with the baguette croutons.